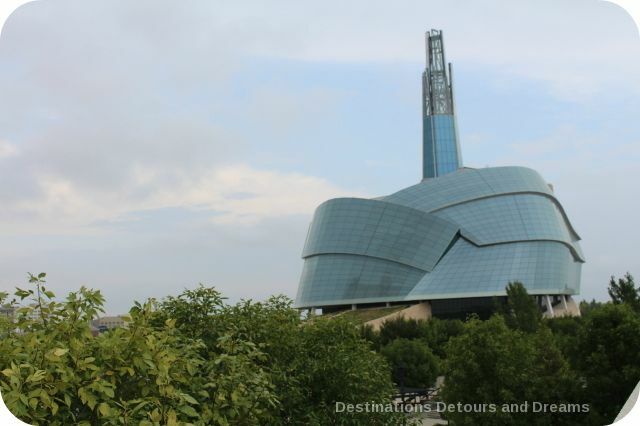 The newest tourist attraction in Winnipeg, Manitoba and a spectacular addition to its skyline is the Canadian Museum for Human Rights. I first visited the museum shortly after it opened in September 2014. I wrote about that visit, but at the time only half of the 11 galleries were open, with the remaining galleries slated to open a few weeks later. The museum has been attracting visitors for almost a year now and I returned to visit all the galleries. 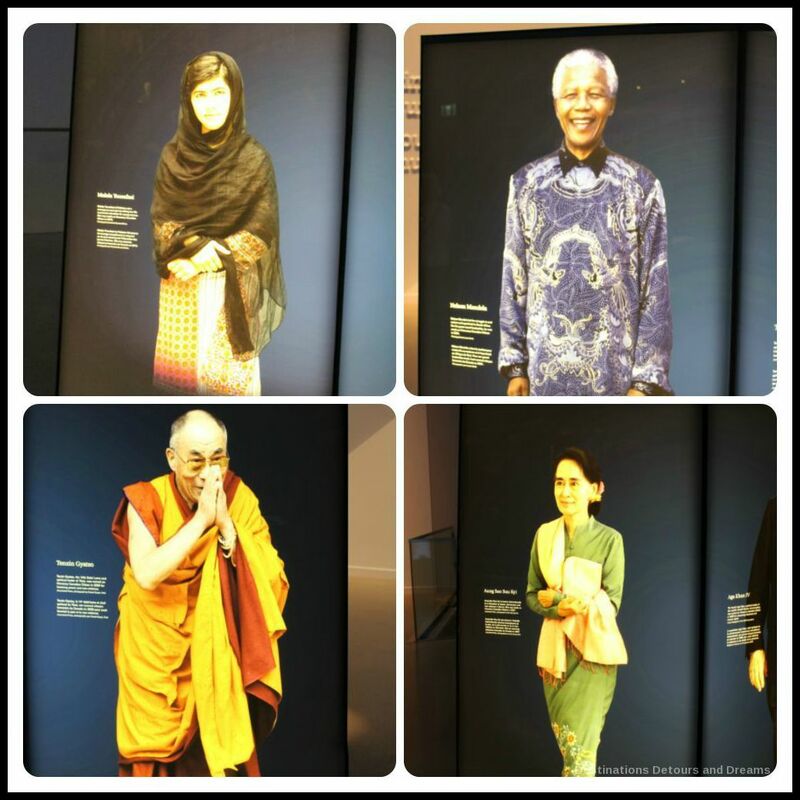 The museum is dedicated to the evolution, celebration, and future of human rights. 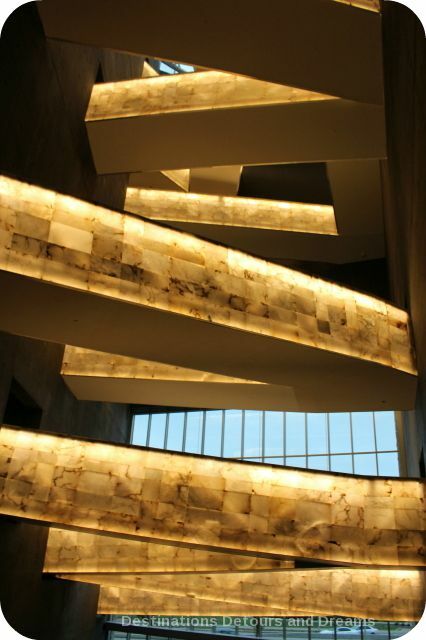 The design of the building, by architect Antoine Predock, is part of the overall experience and symbolizes the idea of an upward struggle for human rights, a journey of hope. The four foundations or “roots”, three of which have prairie grasses growing on them, provide the connection to the earth. The walls of the “mountain” are made of prairie Tyndall stone. Fifteen hundred light blue panels of glass, no two exactly the same shape, on the “cloud” resemble the wings of a dove. The “Tower of Hope” projects upward from the cloud. The tower is illuminated at night as a symbol of enlightenment. 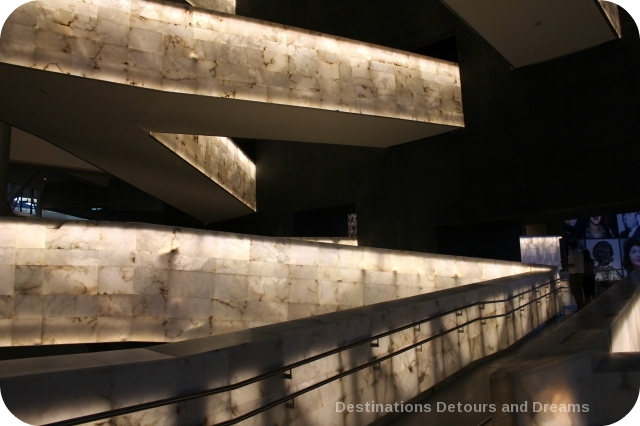 Inside the museum, ramps, lined in Spanish alabaster lit from the inside with LED lights, lead one upward through the galleries, symbolic of a journey of light through darkness. The galleries use multi-sensory exhibits to engage people in discussion and encourage commitment to action against hate and oppression: textual information on panels, films, changing projections of images and texts on walls, interactive video recordings, and visual displays. 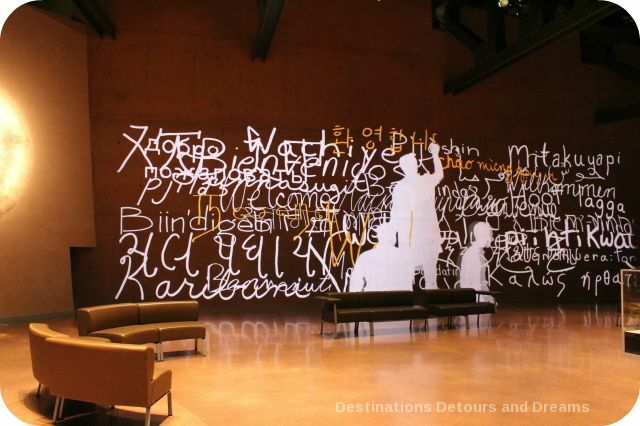 You will also find inspiring quotes on walls throughout the museum. The first gallery is What are Human Rights?, a question people have grappled with throughout time. 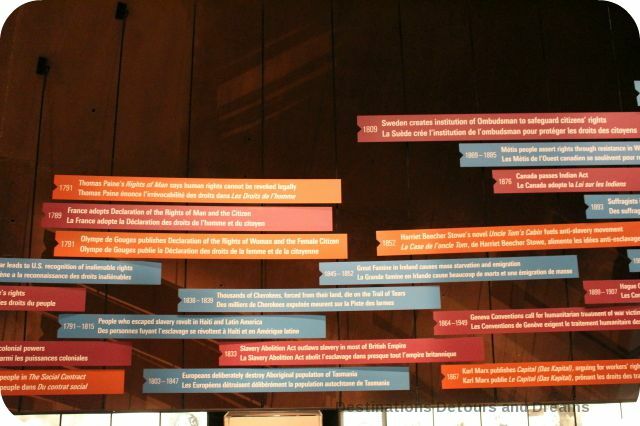 A timeline of selected moments in human rights history is presented. Indigenous Perspectives focuses on First Nations, Métis, and Inuit peoples’ concepts of rights and responsibilities. A film shown in a circular theatre shares indigenous stories told across four generations. The 360-degree view of stunning scenery, wildlife, and narrators pulls the viewer into the middle of the film. I found the Canadian Journeys gallery particularly interesting. 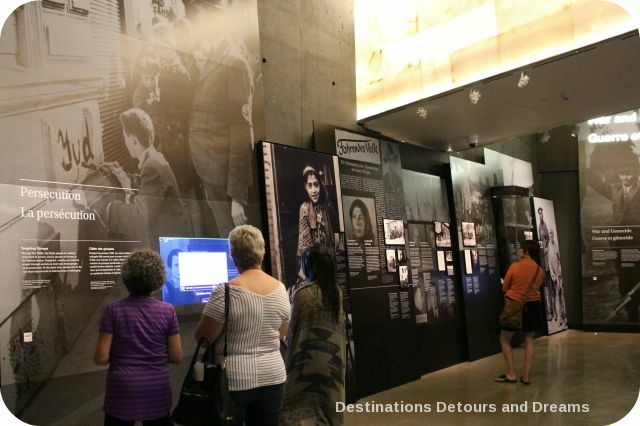 The gallery focuses on the steps and missteps along the road to greater rights for everyone in Canada. I was familiar with some of the stories highlighted here: the plight of Chinese immigrants who helped build the railways, the underground railroad – the secret network which helped people escape from slavery in the United States to Canada, the internment of Japanese in World War II, language struggles, and women fighting for the right to vote. But I learned more about these stories and discovered new stories I’d been unaware of. In 1917, in order to ensure support for the war effort, the government stripped votes from certain groups, such as pacifist Mennonites. Such interference is illegal today. In 1916, a group of Francophone women armed with hatpins (those old hatpins look deadly!) occupied a school in Ottawa to protest Ontario’s English-only laws. Viola Desmond was a black Nova Scotian businesswoman who challenged racial segregation. 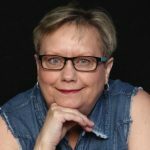 Her fight started when she took a seat on the main floor of a film theatre in Glasgow, Nova Scotia, unaware the floor was reserved for whites. Although segregation was never enshrined in Canadian law, this story is a reminder that segregation existed in more informal ways. Because I have read and heard quite a bit about the residential school system over the past few years, I expected to pass over that exhibit quickly with little impact. But a ten-minute film, in which survivors recounted their stories, moved me to tears. The government-sponsored religious-based schools were first created in the 1880s to assimilate aboriginal children into European-Canadian culture. Children were taken from their communities and placed into boarding schools. They were forbidden to speak their language or practice their culture. In many cases, abuse occurred. The last of the schools operated into the 1960s. In 2005, after lengthy litigation, the Canadian govenment established a compensation package for survivors and in 2008 issued a formal apology. 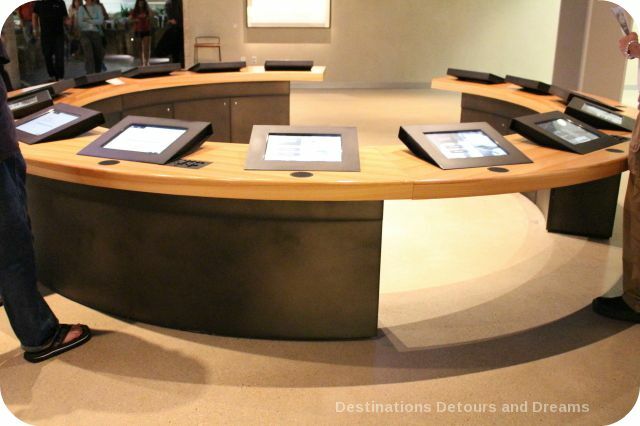 A booth at the end of the Canadian Journeys gallery offers visitors a chance to record and share their own stories. Protecting Rights in Canada focuses on the evolution of the Canadian legal system to protect human rights. Interactive screens for visitors to vote on human rights legal issues. Examining the Holocaust reminds us of the fragility of human rights. The gallery felt more dark and closed in than other galleries. Images were mostly in black and white. The effect added to the oppressive nature of the topic. The main part of the gallery contains stories of the Holocaust. One end of the gallery contains stories of other genocides. The galleries beyond Examining the Holocaust move one more into light and hope. Breaking the Silence is about daring to speak out against atrocities. Actions Count highlights Canadians making a difference. Rights Today encourages us to think about our role in contemporary human rights. Expressions contains a travelling exhibit from the Canadian War Museum about peace. 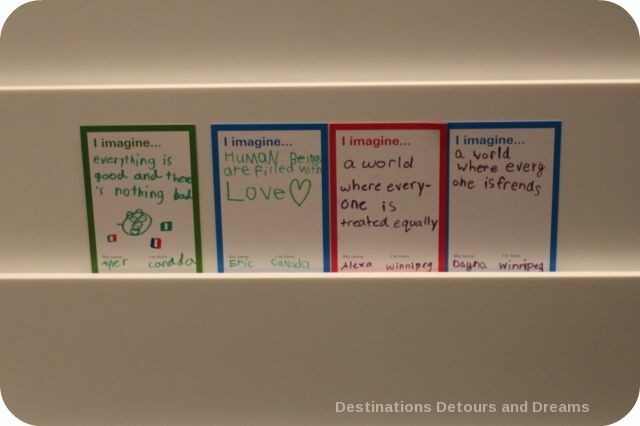 Inspiring Change contains exhibits of triumph and offers visitors a chance to share their thoughts on human rights. The design of the building contributes to the overall experience. I felt it in my first visit and I felt it again this time. There is a calm, restful atmosphere that fosters reflection. The museum is open seven days a week in summer, six days (closed Mondays) the rest of the year. You can wander through on your own or take one of several guided tours. The Mikinak-Keya tour explores rights and responsibilities from a First Nations perspective. 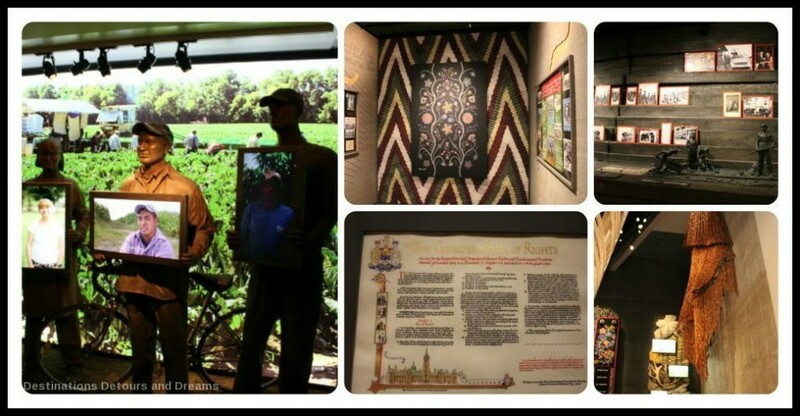 The Explore the Galleries tour focuses on the exhibits. The Discover the Building tour focuses on the building architecture and the encounter between architecture and human rights. There is also a free mobile application that can be downloaded and used as a tour guide. The museum website recommends you allow three to four hours for your visit. I found that by two-and-a-half to three hours I’d reached a point where it was difficult to absorb more information. However, I live in the city and know I can easily return to explore more deeply those exhibits I skimmed over. I also visited alone. If I had been with someone and we’d discussed items, something I saw many of the visitors doing, my visit could easily have stretched another hour. The museum is accessible. The ramps are not the only mechanism to get from one level to the next. Elevators are available. All videos with spoken words (excluding music lyrics) are interpreted via ASL and LSQ on screen and have CC in both English and French. A Braille gallery guide is available. Although not all exhibits are appropriate for children, the museum welcomes children and several exhibits have been designed with children in mind, such as the motion-sensor light game in the Canadian Journeys gallery. Summer programming featured special activities for children. Museum staff can help guide you and your child. I witnessed this being done as I toured the museum and overhead one little girl tell a guide she wanted to work in the museum when she grew up. See the museum website for more information. Wow Donna, this is about as impressive as anything I have seen. How lucky that you are in close proximity. I think it may take several trips to absorb all they have to offer. Really loved this follow up post! 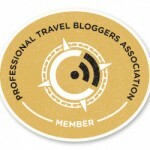 Thanks Jacquie – I agree it could several trips to absorb it all. Great post Donna! You’ve really captured what the experience is all about. We are indeed lucky to live near this museum. Thanks Deb. It is quite a museum to have in one’s own city. Catarina, sadly the developed world doesn’t have the greatest record on human rights either. In addition to pointing out many human rights abuses but there are also lots of stories about people and groups working to right things. I love the idea of this museum. I remember it from your earlier post. I suspect I could spend quite a bit of time there and I am hopeful that someday I will do just that. Ken, I found it easy to lose track of time in this museum. Hopefully you get to see it one day. Hi Donna, I remember reading your original post and was impressed at that time. I think it’s wonderful to have a Museum highlighting human right wrongs but also how society has, in many ways, moved forward. One thing I would like to point out – we live in an area with close proximity to 4 native reserves. When I was still working I was particularly involved with the Cape Croker Community, a reserve whose leadership I had a great deal of respect for. Because of that, I know there was abuse at the Residential Schools, but there was also an opportunity for people to get an education they would never have been able to receive otherwise – this came direct from Native Professionals who had gone the Residential School route. I guess that was a bit of a ramble off the main topic but it came as something of a surprise that not all the schools were bad or that all the natives resented them. Thanks for sharing this post. From what I see around us today, we still have a ways to go. Hope you do a follow-up again next year. Be interesting to see if anything has moved forward in this regard. What an amazing museum. You really described the exhibits in an enticing way and I sure learned a few things I hadn’t known–the residential schools being one of them. Shared on tumblr. Thanks Rose Mary – glad you enjoyed my descriptions. I’m with Ken, I do love the idea of this museum. I know I would spend quite a bit of time there and I know Iw would love it. This is yet another reason to visit that area in the future. Thanks so much for sharing Donna. Susan, it is truly a museum that fosters reflection. 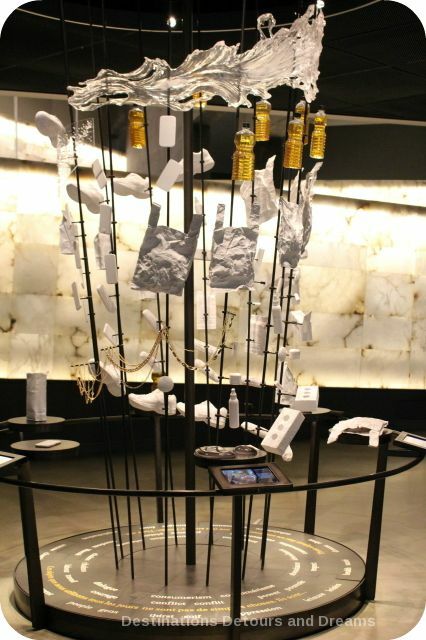 Wow – this is not your ordinary museum! 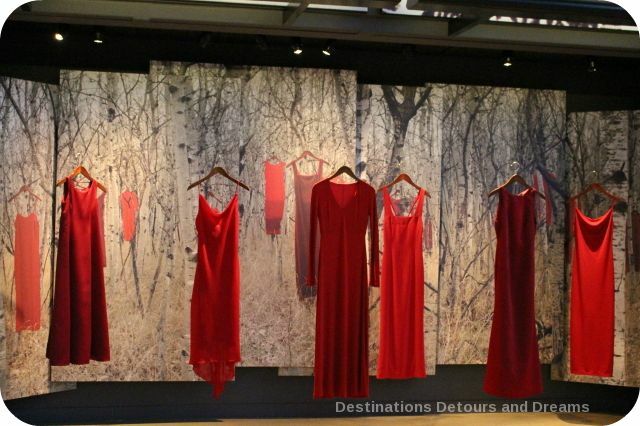 I like the Canadian Journeys Gallery and the Redress Project. How fortunate you to live in close proximity of this museum. Thanks Phoenicia. Definitely not your ordinary museum. 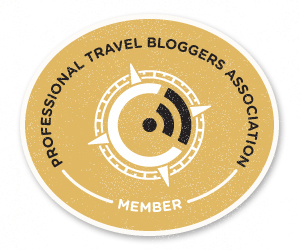 Thank you for the update on this truly amazing place! (Has it really been a year since you told us about it?) I really want to see it. Do you think about a week would do it? It looks so inviting from the entry hall projection and through all the areas you pictured for us. Beth, there is a lot to take in at the museum, but you can certainly enjoy it in less than a week! AWESOME post, Donna. You’ve really made me want to get to the museum. I admit I still haven’t been there, and here you are, making your second visit. Doreen, the museum is worth visiting. Hope you get there soon. I remember reading your first post about the museum, and eagerly awaiting this one! I’d love to visit in person sometime, but for now my favorite is the children’s thoughts at the end. So innocent and sweet, it gives me hope. Thanks for sharing with us! Meredith, the children’s thoughts are sweet. There are some thoughts left by adults as well. What a lovely museum. I love the pictures. This would be a great field trip for kids in school. Very empowering stuff. Thanks for sharing. Sabrina, it would be a great field trip for kids. The museum has a program to help schools with field visits. I remember when this opened. This is one of those places I hope to be able to visit someday. I hope it does well and expands over the years. Thank you for sharing this with us. William, it will be interesting to see how the museum develops. Hope you get to visit someday. oh Donna i would absolutely love to visit this museum! Your article is such a welcome contrast to a story i read earlier this morning about modern day slavery. It’s been a few years since I last visited Canada but this gives me just one more reason to add a return visit to my bucket list. Thanks – the museum has a lot of stories that can be difficult to take in, but there is also a lot of hope. Thank you so much for walking us through that! I’ve followed the journey of this museum, along from its inception by Izzy Asper. So wonderful that his daughter Gail made his dream come true. I’ve never been to Winnipeg, but would consider making a special trip just to see this. 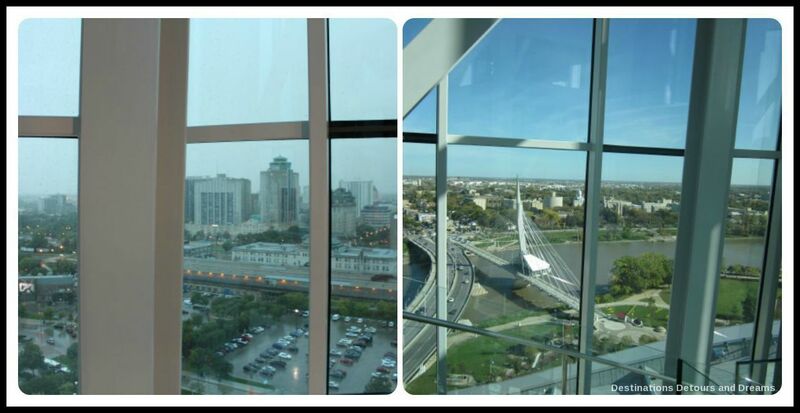 You are lucky to be in Winnipeg, where you can experience it when you want! I think its great that they make certain displays with children in mind. Children should be exposed to this type of thing so they have a sense of concern and empathy for others not quite as fortunate as themselves. And of course, it is important to do it in a way that they can handle and that will be enlightening as opposed to scary. Erica, I agree children need to be exposed to this type of thing in age-appropriate ways. The museum has guides grouped by age levels to help parents and care-givers take children through the museum. l love the pictures! you really captured the museum. I would love to visit . . .
I’m glad you enjoyed the visit. Donna, I was impressed with the concept of a Human Rights Museum. Since I am not getting to Winnipeg anytime soon, I looked for a similar museum here in the U.S. Truth be told I didn’t expect to find one. 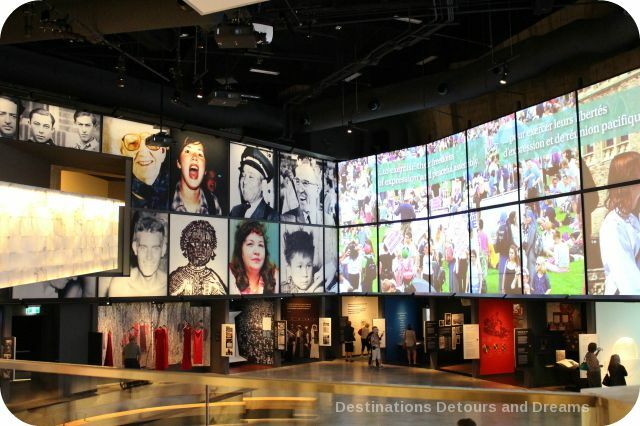 The National Center for Civil and Human Rights in Atlanta, GA seems like a similar experience. Of course I’m not getting to Georgia anytime soon either. Kire, the idea of a human rights museum is a fairly unique concept. I learned about the center in Atlanta when doing some online research, but I haven’t discovered any museums other than the Atlanta and Winnipeg ones focused solely on human rights. Donna — what a wonderful museum. Thanks for the tour. What’s sad is that the world seems to be a place where human rights are being trampled — especially in the Middle East. And slavery still exists — women are kidnapped and sold as prostitutes. There is still so much bias. But this museum is a reminder that there is still hope that things will get better. Jeannette, it is indeed sad that human rights keep getting trampled. The stories in the museum remind one that abuses continue, but also celebrate the victories and people fighting to make things better. I’d love to visit the Canadian Museum for Human Rights and am grateful it is bringing attention to genocides that have gone unnoticed around the world – I believe they have included the genocide of the Maya in Guatemala. Thanks for the comprehensive report! Michele, as the museum was getting close to opening there was a lot of controversy about what would and wouldn’t be in it. Sadly, there are so many genocides and human rights abuses, it is difficult to cover them all in one museum. I think the museum has done a pretty good job. This looks like a fascinating and exceptionally well designed museum. I never knew about the “residential” school system. How awful (yet hardly unique). I’m hoping to get to Manitoba next year and if I do I will allow at least half a day for the Museum for Human Rights. Kay, I think you definitely should put the Museum for Human Rights on your Manitoba agenda. It is one of the top things I would recommend to visitors. Again, what a detailed post on a place worth seeing You have a gift of painstakingly describing one and giving it your own simple spin that entices people to see for themselves. Is Winnipeg the center for the First Nations’ struggles for human rights? Is this why the Museum was built there? I love the overall symbolic architecture, inside and out, and, in particular, the REDress exhibit. Thanks again for such a well-written article, welcome back to Canada, and Happy Thanksgiving! Thanks Carol. I’ve never heard Winnipeg called the centre of the First Nations’ struggle, but Winnipeg and Manitoba have a significant First Nations population and there is history here with regard to their struggles. That and other history in Winnipeg makes it a good location for the museum, but the reason the museum is here is because it is the vision of Izzy Asper, a Winnipeg-based businessman and philanthropist. After his death, his family continued to lobby and fund raise to ensure the museum was built. Architecturally stunning as a building. I think museums like this a necessary. Yes they are confronting when you see what man does to man, but sometimes we need this to make sure that we move forward positively, and there is so much good that does happen. I always get a shock at places like this where we can see just how human rights have been violated. I was moved to tears at the Killing Fields in Cambodia, but good to shock people and make them aware. Paula, it is architecturally stunning. I agree that we need to be reminded of the horrible things man has done to man and be moved into positive action. Beautiful museum, Donna. I think our current PM needs to pay a visit. He doesn’t seem to have a problem trampling on our human rights these days. We learned about Viola Desmond in school in Nova Scotia. I love the REDdress project. 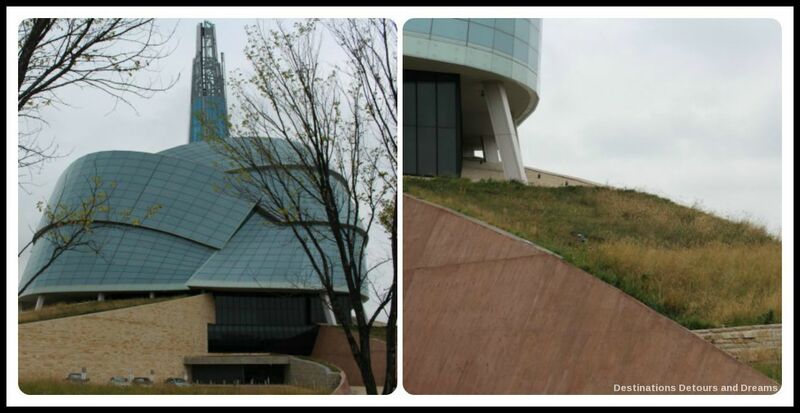 This museum is a lovely addition to the city of Winnipeg, and another great reason to visit. Nancie, I don’t recall learning about Viola Desmond in school in Manitoba. I have a number of teacher friends (most of my friends are retired now, but children of friends are starting to teach). I’ll have to ask them if the Viola Desmond story is in the curriculum. Thanks Suzanne. The Museum got a lot of coverage in Manitoba and I think a fair bit across Canada, but I don’t know how much it has been promoted south of the border. 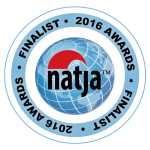 It is certainly featured on Manitoba and Winnipeg tourism sites. 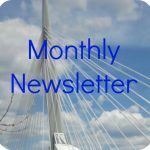 I am so impressed by what Winnipeg is doing with this museum and other cultural improvements which I wouldn’t have the first clue about were it not for your faithful posts. This is such a beautiful rendition of a variety of issues associated with each other under the larger umbrella of human rights. Very powerful. Betsy, I would definitely describe the experience of visiting the museum as powerful. Linda, it is a remarkable legacy. I don’t know a lot about the Aboriginal history in Australia, but sadly I think there is some parallelism with what happened in Canada. Antoine Predock’s architecture is the first indication of what’s to come inside this amazing place. Kindness and human rights chronicled! Simply beautiful. Thanks for the thorough view! 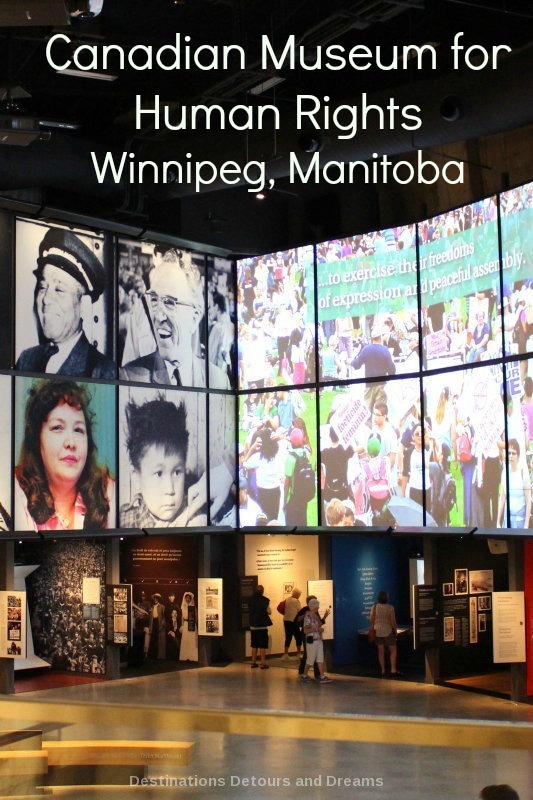 It would seem my experience as a Canadian may not be fully complete until I return to Winnipeg and visit the Canadian Museum for Human Rights for the first time. I’ve seen and read coverage about the museum’s opening on CBC. The building itself looks phenomenal. The building and exhibits are certainly worth a visit, in my opinion. An amazing design and an interesting concept, Human Rights. Beautiful photos and narrative Donna, I felt like I was there with you! Thanks. It is an interesting concept and experience. Thanks for the update. I’ve saved this to my Canada Pinterest board in hopes that others will find it if they are visiting Winnipeg. Suzanne, this museum tops my list of recommendations for things to do and see in Winnipeg.